Located in the Sonoran Desert of southern California, Palm Springs is a resort city that is quite popular with Canadians looking to head south to escape winter’s chill. The region typically sees over 350 days of sunshine each year, so it’s a safe bet that the weather will be sunny, warm and dry. Palm Springs is only a 3-4 hour flight for those living in Western Canada and it’s conveniently located 175 km east of Los Angeles, 200 km northeast of San Diego, and 430 west of Phoenix, AZ. If you’re already visiting California and you want to include a visit to Palm Springs, you can easily catch a bus or train from most major cities. You can search for bus and train schedules on GoTicket. Although the main goal for our most recent trip to Palm Springs was to sit by the pool and soak up that hot California sunshine, we did manage to get out and do a little exploring. Here are a few things to do in Palm Springs. A popular way to get outdoors and experience the rugged desert mountains is to take a ride on the Palm Springs Aerial Tramway, proudly labeled as the largest rotating aerial tramway in the world. The tramway travels over two-and-one-half miles and stops at an elevation of 8,516 feet. The ride takes approximately 10 minutes and rewards visitors with outstanding views of the rocky Chino Canyon and the desert plains of the Coachella Valley. 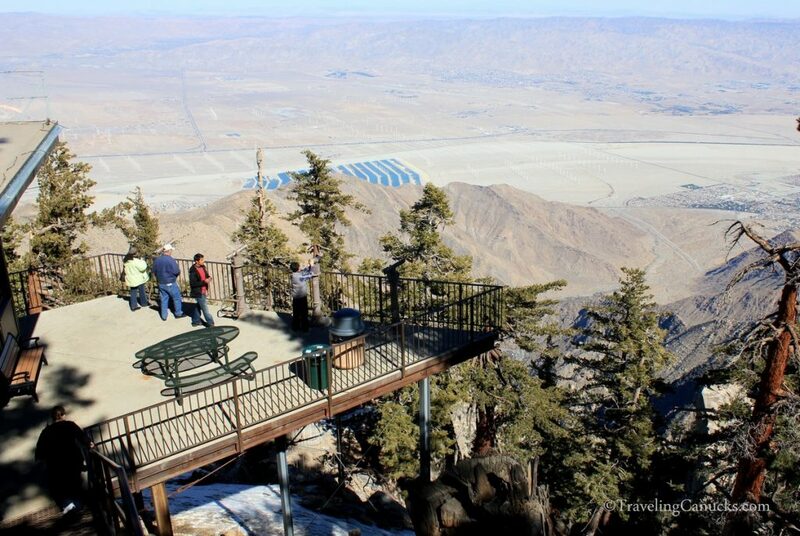 Learn more about the Palm Springs Aerial Tramway here. Don’t miss a new post! Get our new posts delivered to your email inbox. At 10,834 feet (3,302 m), San Jacinto Peak is the highest peak of the San Jacinto Mountains and is ranked sixth among peaks in the 48 contiguous states. Mount San Jacinto State Park offers hikers a variety of trails and is accessible from the top of the Palm Springs Aerial Tramway, so you can double up on your activities. More info about Mount San Jacinto State Park here. 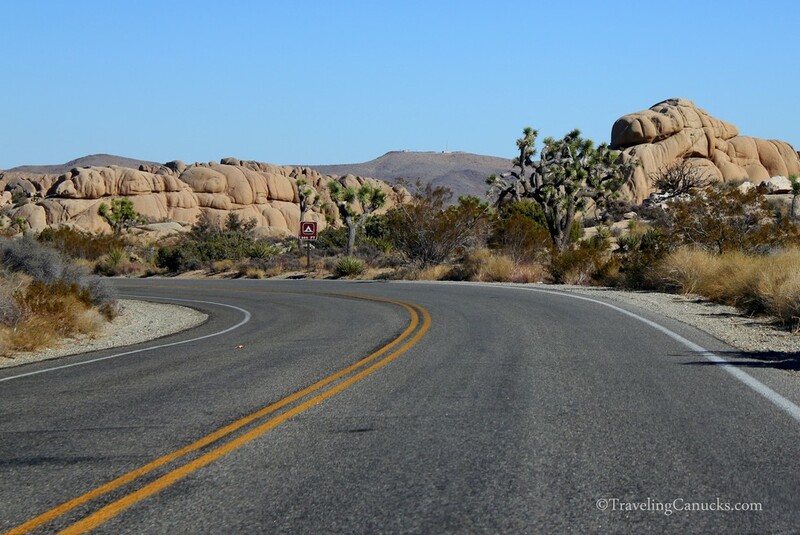 Joshua Tree National Park is about a 30-45 minute drive from Palm Springs, making it a great day trip or overnight camping destination. The unique rock formations in the park were formed over 100 million years ago, eroded by groundwater that shaped and molded the enormous, smooth rocks (pictured above). It’s no surprise that this legendary national park is hugely popular with rock climbers, mountains bikers, hikers and outdoor enthusiasts. More info about Joshua Tree National Park here. Every Thursday night, Palm Canyon Drive becomes an old fashioned street fair, with live musicians, street food, handmade crafts, original artwork and a fresh farmers market. Depending on the time of year, the street festival begins at either 6:00 PM or 7:00 PM. Villagefest is a fun place to sample some local food and pick up a few souvenirs while watching an entertaining street performance. For the past 20 years, Villagefest is voted as the best event in the area, attracting thousands of visitors each week. More info about Villagefest here. For a fun activity the whole family will enjoy, head to the Living Desert Zoo and Gardens, famous for its endless desert gardens and unique wildlife – including African animals like leopards, cheetahs, wild dogs, zebra and giraffes. Visitors can discover over 450 animals species and over 1,200 acres of lush botanical gardens while on a private safari or group tour. Kids can ride a camel, feed the giraffes and take a ride on the trolley. There are plenty live shows and events throughout they year, so make sure you check the calendar of events ahead of time. Have you visited Palm Springs? What did we miss? This post is sponsored by GoTicket. All opinions expressed are our own. Me and my daughter were in Palm Springs last summer! We were staying in a small town called Anza, up in the mountains, which was good because we got to leave the heat down in the desert in the afternoon. I think a visit to the Andreas Canyon is a very nice thing to do. It’s a part of the Agua Caliente Band of Cahuilla Indians Reservation, and the landscape is stunning.. We went for the short trail, but there are various lenghts to choose between. Afterwards we ate at a lovely vegan restaurant Palm Greens Cafe, soooo good!